Here are two pictures of my son, eating a mango in one of his little "net pops" as I like to call them. 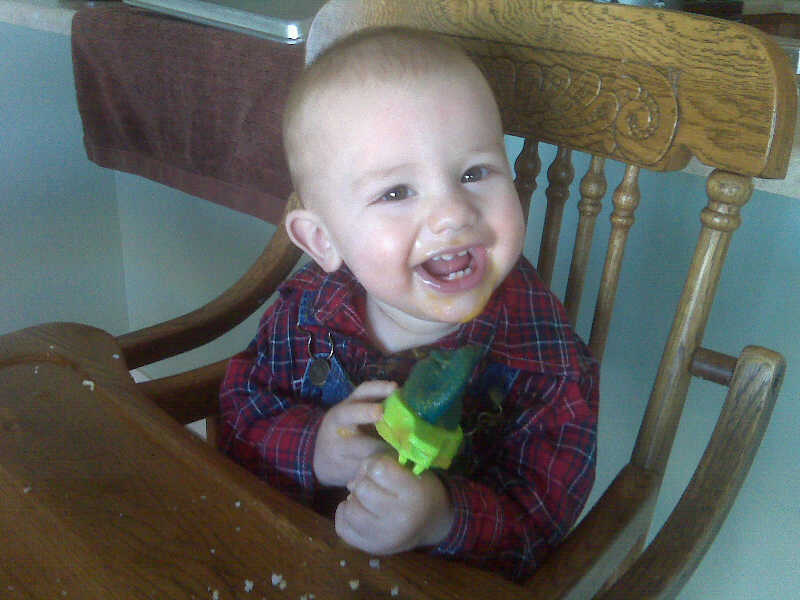 In the first picture you'll notice that he is squeezing the juice out all over his hands and onto his outfit, the high chair, the floor. 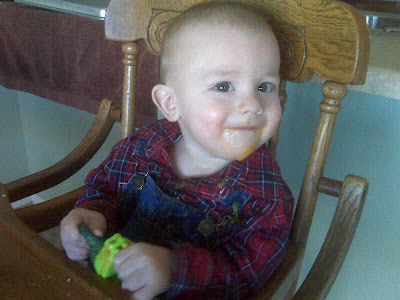 There is mango pulp and juice dripping down his chin into the folds of his neck and all over his shirt and overalls. He thinks he can fool me with that coy little smile of his, but I see right through it. This is my son, baring his 7 scraggly teeth (that sometimes bite!) in a cheesy grin and melting my heart even through the mess and my scheduled plans and my already overloaded pile of dirty laundry. Between this mango moment, a messy hands-on dinner, one too long unchanged very very wet diaper and bedtime prep, this child went through no less than four different outfits yesterday. Yesterday was a struggle as so many days are. But that cheesy knowing open-mouthed smile was my payment for the troubles. It was one of my Kairos moments yesterday. I'm so glad I caught it. Read this awesome post by Glennon Melton titled, "Don't Carpe Diem" to see what I mean by "Kairos moment". And tell me, what was your latest Kairos moment? As exhausting and demanding my girls can be, I love it when we can snuggle together, read a book, and talk, identify body parts, and sing silly songs. But, I also love, love, love when my twins give each other a hug, and even kisses! Nothing melts my heart more! It is so sweet. I think it's time for some bibs. I know what you mean. I really enjoyed that article and it definitely gave me some perspective. I am grateful for those moments that make it worth it!